Marvel's Spider-Man is a great looking game. Some might even say, it's one of the best-looking games, ever, especially when it's running on a PlayStation 4 Pro. But not everything in it looks great and is coated with a thick layer of polish. No, some parts of the game look straight out of a 90s fever-dream after a long-day of playing PlayStation 1. Such as the game's "Boat People," which are utter abominations. That's right, if you didn't know already, Marvel's Spider-Man is part survival-horror. For players that dare venture into the Hudson River, there are no sharks, but there is something worse: Boat People. As you may know, low detail models are common in video games as a way to save computing power for models you aren't meant to see but from far away. The technique, dubbed LOD, has been around since 3D models stormed gaming, and they are an effective trick, because from far away, these abominations look fine. But if you get up close, well then their low detail-ness shines in full glory. Again, the idea is you really aren't supposed to ever see them up this close, which explains why getting to the game's various Boat People isn't very easy. You have to go out of your way, and essentially battle the water to get there. But the reward is worth the struggle. Now, if you played Spider-Man 2, you will remember it also had infamously horrible boat models that everyone had a good laugh at. These look even worse....on purpose. 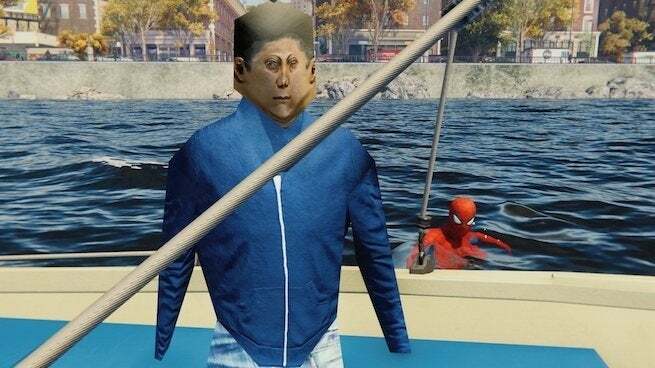 In other words, Marvel's Spider-Man's Boat People are actually a clever little easter egg by Insomniac Games, who, as everyone knows by now, loves its easter eggs. Best easter egg in the game? Probably. And to be honest, I kind of wish there was an option to make every character look like this. That would be a great game to play for Halloween this year. Marvel's Spider-Man is available exclusively for PlayStation 4. And if you haven't bought it already, here's the game of the year-type stuff you're missing out on.